The Greater Hewitt Chamber has been serving Hewitt and its surrounding communities since 1978, and we work closely with the City of Hewitt on business, economic and community development. The Greater Hewitt Chamber also works to promote tourism and serves as a visitor bureau for Hewitt. A chamber is a local association formed to promote and protect the interests of the business community in a particular place. Chambers have local businesses as members who elect a board of directors to set policy for the organization; the board then hires a director and staff to operate the chamber. Each chamber operates separately but may form regional partnerships and/or join state, national and international bodies. Since 1978, our mission has been to promote an environment of goodwill and prosperity among businesses, residents and civic organizations in the greater Hewitt area. We strive to foster, protect and promote the commercial, industrial, civic, agricultural and general interests of the Hewitt community. As of now, the Chamber represents 19,000 jobs and 35+ local non-profit organizations, with $70,000 awarded to local students through the Greater Hewitt Chamber Scholarship Fund since 2008. To be one of the highest performing chambers in service and community development in the state of Texas by continuing to provide quality information to members, attract visitors to the area through signature events and building positive rapport between the community and residents. To consistently seek community needs and opportunities to excel while evaluating the chamber’s services. The Chamber connects our members to leaders and legislators for providing relevant and up-to-date information for small business operations. Utilize access for resources available through the largest business networks in the nation. Our annual banquet is a popular event with an average attendance of 500. The event begins with a cocktail hour (cash bar) for networking and live music followed by a catered dinner. The program includes the President’s annual report, a brief speech from the incoming Chamber president, and award recognition for Business of the Year, New Member of the Year, Ambassador of the Year, and Volunteer of the Year awards. The scholarship presentation is then followed by the keynote speaker. Past keynote speakers include Nate Self, Neal Jeffrey, Isaiah Austin, Dr. Johnette McKown, Heath Nielsen, Judge Ken Starr and Drayton McLane. The banquet concludes with a drawing for luxury raffle prizes. This event is open to the public and benefits the Greater Hewitt Chamber Scholarship Fund. The Greater Hewitt Chamber’s Nacho Daddy Car Show & Concert presented by HEB Woodway is held every May at Warren Park in Hewitt. This fun community event features a car show with cash prizes, live music, food trucks, kids zone and more! This event benefits Hunger Free MISD, a program that sends backpacks full of nutrition food home with food insecure Midway students over weekends and holiday breaks. Students are selected from all ages and campuses based on counselor recommendations and parent acknowledgement. Our annual tournament presented by the City of Hewitt features prizes on every hole including a chance to win $1 million and/or a new vehicle! Registration fees include green fees, 2 mulligans, cart, lunch, goodie bag with sponsored items, and the chance to win lots of prizes. To be eligible for your team to win the Prizes on Every Hole – including name-brand wedges, drivers, putters, set of irons, golf balls & golf bags – a Super Pass is available for purchase at check in. Proceeds from the Greater Hewitt Chamber’s annual golf tournament go toward the Greater Hewitt Chamber Scholarship Fund as well as community development. The Creekside Spooktacular presented by Regent Care Center and the City of Hewitt includes trick or treating, games, costume contests, prizes & more! Admission is FREE, and the event is fun for the whole family. Games and children’s activities are available from 6:00 pm to 8:00 pm, and the costume contest consisting of three age group categories (0-3, 4-7 & 8-12) is at 7:00 p.m. Prizes are awarded to the first-place winner in each age group. Come hungry, and enjoy food trucks with a variety of food for sale! A portion of the event proceeds go toward Hewitt First United Methodist Church’s Hallelujah Food Pantry. We have 29 total directors that serve on a volunteer basis and meet monthly on chamber operations, budget & mission fulfillment. The board has over 300 years of combined experience in various industries—from small business to Fortune 500 & international business development—and is led by an Executive Committee which acts on matters requiring immediate attention. This committee is comprised of the president, 1st and 2nd vice presidents, secretary, treasurer and immediate past president. Our ambassadors are member volunteers that serve as face of the Chamber and extension of board’s leadership. They support the Chamber’s membership retention plan by reaching out to fellow members to provide information and encouragement. We currently have 50 ambassadors serving the Chamber. The Chamber’s staff consists of Executive Director Alissa Cady. Under the board’s direction, the staff handles day-to-day operations including membership recruitment and retention, event planning, volunteer training and coordination, managing the production of the Chamber’s print publications and managing the Chamber’s digital marketing including website, social media and e-mail marketing. The staff also continually works to build relationships with area agencies, non-profits, chambers and media outlets. This issue gives a brief glimpse at Hewitt’s history, as well as current growth and diversity in the greater Hewitt and Waco area. 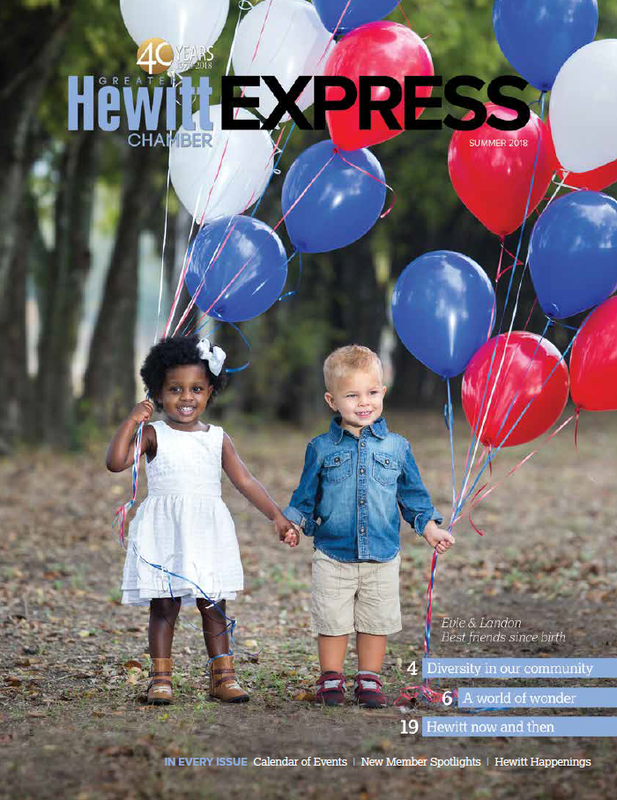 Read all about Hewitt’s library, financial tips for businesses and individuals, Midway ISD registration information and more in this issue of the Greater Hewitt Chamber Express Magazine! The Greater Hewitt Chamber is excited to be celebrating our 40th anniversary this year! 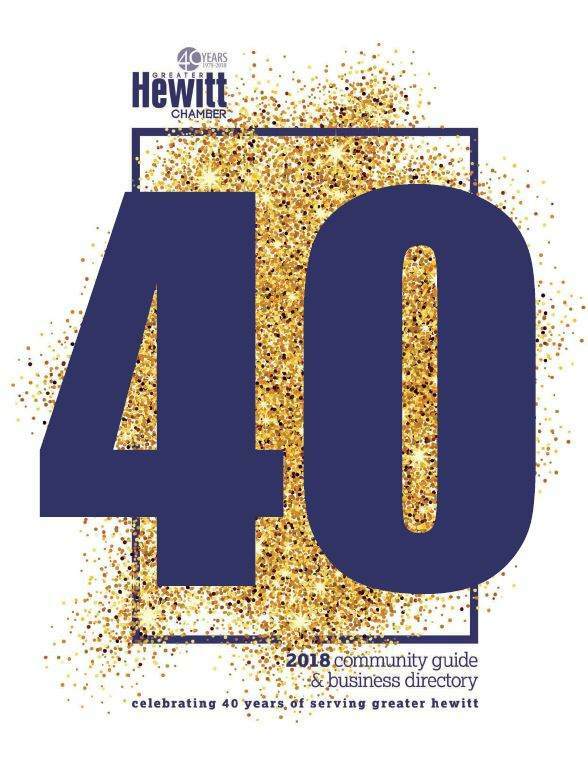 Inside this edition of our award-winning directory, you’ll see why Hewitt is known for its safety, schools, quality of life and affordability. We are proud to call Hewitt home and to serve such a wonderful community.